Part 2 of my "Downton Abbey" experience on an equestrian vacation at Castle Leslie Estate in Ireland. Read Part 1 of my adventures at Castle Leslie. 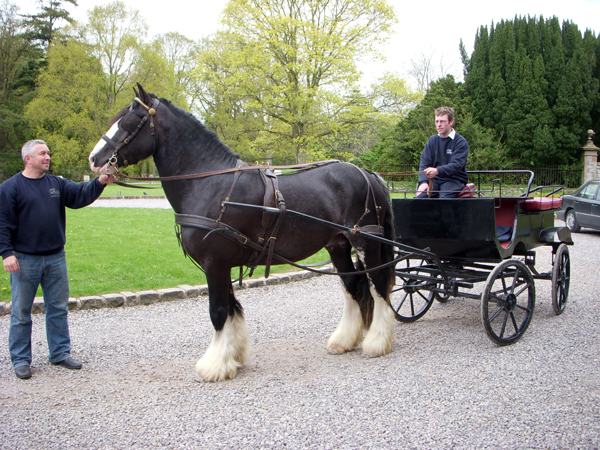 A great way to explore Castle Leslie Estate for non-riders or the horsey set is to hop aboard one of the estate's carriages. Sammy Leslie, a member of the founding family, invited me on a carriage ride for an insider's tour of this old Irish landmark. 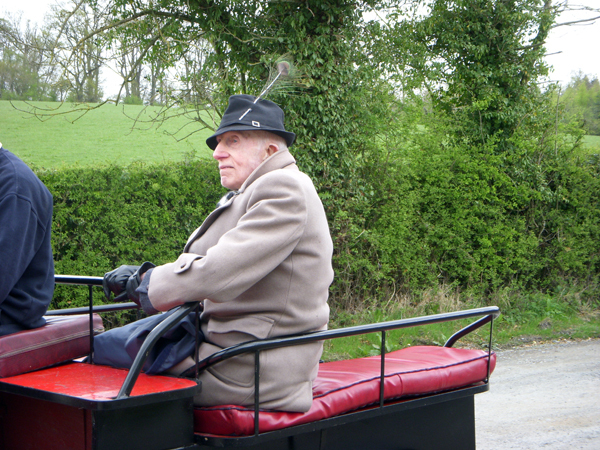 Getting ready for a carriage ride at Castle Leslie Estate. As we trotted along the estate bridleways, Sammy explained that she started attracting guests to their longtime family estate in the 1990’s by opening a tearoom in the castle. Later, Sammy would offer dinner to guests and then began hosting events. Castle Leslie is well known for major weddings, like Paul McCartney’s 2002 wedding to Heather Mills. The estate's list of famous guests includes Bono of U2, Mick Jagger of the Rolling Stones and Prince Pierre of Monaco. “Jack” joined us on our carriage ride dressed in a long tan coat with a black hat festooned with a large peacock feather. I could tell from the beginning that Jack is a character, my favorite type of person to meet on my travels. He’s led a full life, living around the world including Italy for 30 years, spending 5 years as a prisoner of war during World War II and hitch hiking across America. You know someone has a lot of energy when they spend their 85th birthday clubbing in Ibiza. Jack’s written a book, “Never a Dull Moment” about his life. I read it on my plane ride home and can say that Jack has led a very interesting life. Sir John Norman Ide "Jack" Leslie, 4th Baronet, who’s led an extremely interesting life and still lives in the castle. Our horse drawn carriage rambled down a tree-lined road towards the Old Stable Mews, which have been restored and converted into lodging for groups and families. We passed one of the estate’s three lakes. Oak trees towered above us, as we drove along past several of cross country jumps. Sammy talked about the changes she’s enacted on the estate to save it and the land from development. Up at the older stables, we got out of the carriage to meet a horse that they’ve got their eye on for racing. I love seeing different stables around the world, especially comparing historic stables to modern ones and seeing the innovative designs that different cultures appreciate. The old gray stone stables at Castle Leslie are centered on a courtyard, so the horses can peak out of their stalls and see each other. A couple of horses stuck their heads out above their bright red doors to say hello as we walked through. A horsey welcome at the old stables. 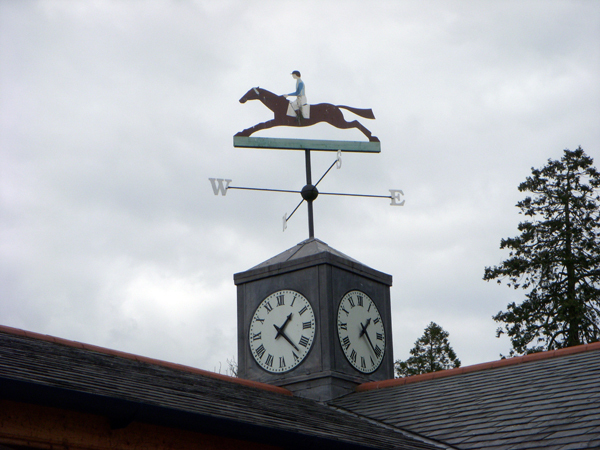 We rode towards the new stables, on the other side of the estate, which are designed around a courtyard as well, adorned with an cool antique weathervane and vibrant blue Victorian lamps. The new stables equestrian design. 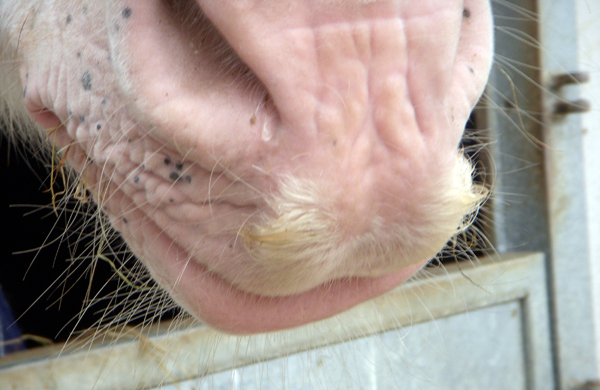 We walked around the stables and met a variety of Castle Leslie’s horses, including one with a very pronounced mustache. Breeds include Connemara Ponies and Irish Sport horses housed in the Castle's stables. We then went to Conor’s Bar for lunch. I sat beside the giant fireplace in a cozy alcove with Sammy and Jack, munching on a ham and cheese sandwich. There are many other things to order in Ireland, but for lunch, I just really like a well toasted sandwich in a warm pub. Conor’s is a more relaxed dining option at Castle Leslie and, like the rest of the estate, has an equestrian theme with old bridles decorating the walls and equestrian artwork. Conor’s Bar often has live music at night. Sammy took us over to the spa before we saddled up for our next Castle Leslie Estate horse ride. The spa is inspired by nature and history. There are Victorian treatment rooms, where you can get wrapped in chocolate truffles, pear steam massages or immerse yourself in a Victorian steam box. Everything is organic. I hoped to have some sort of treatment later, but for now, was anxious to ride again and explore more of this historic estate. 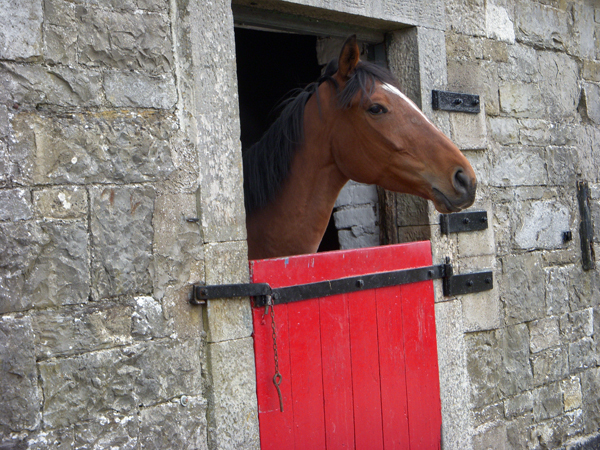 Learn more about riding vacations in Ireland and equestrian vacations at Castle Leslie on EquitrekkingTravel.com. 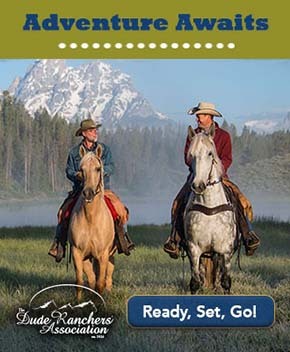 Visit Castle Leslie's page in the Equitrekking Vacation Guide to great ranches and riding vacations. 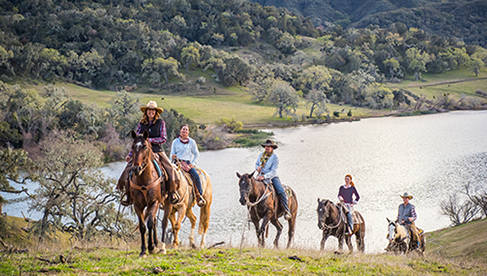 Check out their latest Travel Deals, including "Learn to Ride in Ireland" and "Horse Sport.